Rumor : Napoleon was short. Napoleon was no linebacker, but he certainly was not short either. Using the old French measurement system, he was 5 ft. 2 in. which equals 5 ft. 6 in. by modern measurements. Today, Napoleon might not make the basketball team, but the average height in northern Europe in the late 18th century was 5 ft. 4½ in. Napoleon was 1 ½ inches taller than the average man of his time! Napoleon said that "history is the version of past events that people have decided to agree upon". He would have made a successful PR manager. Leaving nothing to chance, Napoleon would often tell his painters which pose he wanted to be painted in and even what frame to put the painting. Newspaper stories describing Napoleons exploits can not be trusted for he would often pay the newspapers to print his version of battles and would even dictate what the headlines should read. In the above painting by Jacques- Louis David, Napoleon is depicted on a rearing stallion in his journey across the alps. The truth is not as romantic. 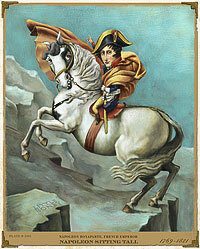 Napoleon actually crossed the alps on a hired mule and thousands of his soldiers died on the journey. 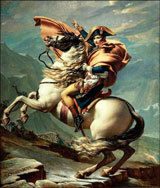 The painting above also shows Napoleon's favorite horse, Margengo. To find more art clues, visit the art detectives section. Napoleon said that, "Four hostile newspapers are more to be feared than a thousand bayonets."